It began with a telephone call placed by Alexander Graham Bell, the founder of what would become AT&T: "Mr. Watson, come here. I want to see you." Its imagined future is as a communications behemoth -- broadband internet, cable and satellite TV hookups, news and entertainment networks, a movie studio. And, yes, phone service. The 140 years between are a story of destruction, reinvention and constant evolution, and one of the most indelible names in American corporate history. 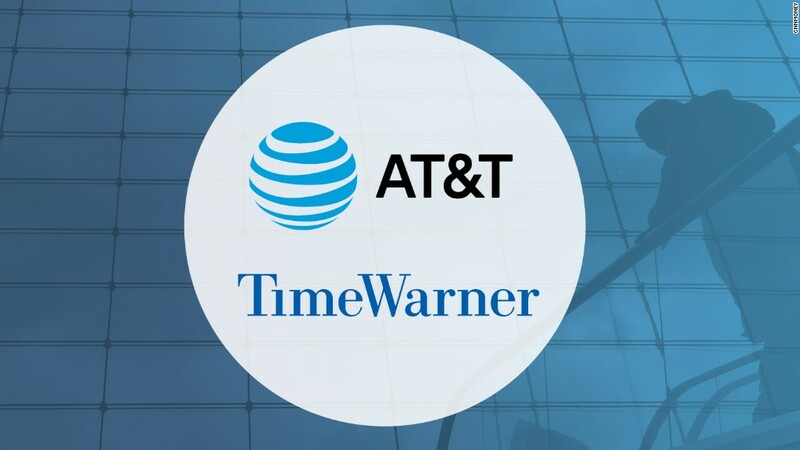 The latest chapter is the proposed $85 billion purchase of Time Warner by AT&T, a deal that would reshape the media and telecommunications industries. "It is a historic company," said telecom industry analyst Jeff Kagan. "The AT&T name has been with us forever. And it's good to see it's still a leader." Bell made his phone call in March 1876. He had just patented his invention and soon founded the Bell Telephone Company, AT&T's earliest predecessor. He began issuing stock to shareholders in 1877. The name itself, short for American Telephone and Telegraph, came in 1885. It was a subsidiary of Bell Telephone set up to operate long-distance calls -- first on a single line from New York to Chicago, and soon to San Francisco. 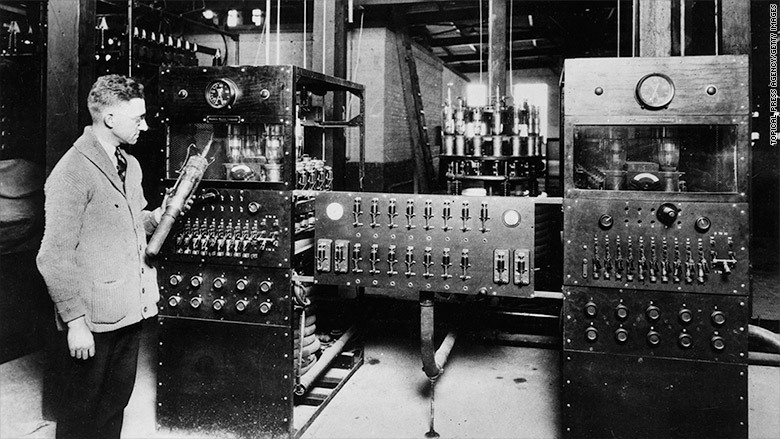 Part of a radio telephone transmitter, as seen in March 1926. AT&T used this for transatlantic telephone tests. Bell's empire -- "Ma Bell," as it would come to be known -- expanded. His patents for the telephone system allowed the company to stave off competition for nearly 20 years before they expired. By the turn of the century, AT&T had purchased its parent company. Bell's invention, meanwhile, was a runaway success. By 1904, the number of telephones in the United States had exploded to more than 3 million. In 1913, AT&T reached the first of three antitrust settlements with the federal government, establishing it as a regulated monopoly. That monopoly held for four decades, then began to erode. An antitrust suit in 1956 compelled AT&T to restrict its operations to the national telephone system and get rid of its engineering and manufacturing arm, Western Electric Company. But the biggest blow came a quarter-century later, when the government forced AT&T to break up in 1982 because of more antitrust concerns. Parent AT&T agreed to focus on its long-distance services, inviting its customers to "reach out and touch someone." Meanwhile, its local telephone operations were divested and turned into seven "Baby Bells." Verizon traces its origins to one of these regional companies. AT&T found other ways to grow. In the 1990s, it bought NCR Corporation, which makes self-service kiosks, barcode scanners and ATMs, and cellular giant McCaw Cellular Communications. The latter would be renamed AT&T Wireless. In 1993, in a remarkably prescient series of TV ads titled "You Will", AT&T imagined the future it would come to inhabit, a world of videoconferencing, smart watches and tablet computers. Five years later, it bought TCI, the second-largest cable company in the United States. A year after that, it bought another cable company, MediaOne, and became the largest cable operator in the country. "AT&T was now the biggest telephone company," Kagan said. "The biggest wireless company. And the biggest cable television company in the country." It was also headed for a fall. Telecom overhaul legislation in 1996 opened AT&T's long-distance services up to competition, including from the Baby Bells it once owned. Rates for long distance, once considered AT&T's bread and butter enterprise, began to fall. "It started to collapse," Kagan said. "They just had to spin everything off." In 2000, AT&T reorganized, shedding AT&T Wireless and AT&T Broadband. AT&T had been crippled. "It was a ghost," Kagan said. "It was terrible. It was depressing. Everybody thought AT&T was going to vanish." But a rebirth was coming. SBC Communications, one of the seven original Baby Bells, purchased the floundering AT&T in 2005. And it kept Ma Bell's name. Over the following years, the new AT&T grew larger. It bought Cingular Wireless, which itself had purchased AT&T Wireless in 2004. Last year, it closed on a deal to acquire satellite television service DirecTV. The Time Warner deal would give the company a way to control content along with distribution -- and compete with Comcast, which owns NBCUniversal. The telecom giant would own several big-name TV networks, including HBO, CNN, TNT, TBS, plus Turner Sports and the Warner Bros. movie studio. Kagan suggested that AT&T will look for ways Time Warner can change to fit its vision -- as it did with DirecTV. The parent company is soon expected to launch a cable-like TV bundle through a new service called "DirecTV Now." "When AT&T acquires companies, they don't run them the way they were," he said. "They integrate them into their complete portfolio."